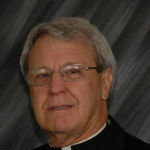 Reverend Peter Garry was appointed pastor of St. Patrick parish in Southold, LI on May 26, 2010. A priest for over 40 years he has served many on Long Island, from Seaford to Southampton. Prior to his current post he was pastor at St. Philip Neri parish, Northport; associate pastor at Most Holy Trinity parish, East Hampton; St. Anne’s parish, Brentwood; St. Martin of Tours parish, Amityville; Our Lady of Grace parish, West Babylon; St. John the Evangelist parish, Riverhead; and St. William the Abbot parish, Seaford. He also served at Southampton College as part-time chaplain.